At the upcoming Prolight and Sound exhibition, RMS will show its latest product, RMSAnywhere. 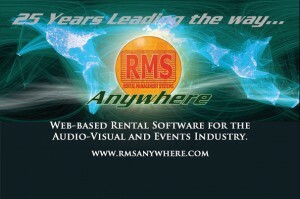 RMSAnywhere is the entirely web-based Rental Software for the Audio- Visual en Event Industry. It’s the complete, fast and clear solution for inventory tracking and planning,from quotation to invoice. RMSAnywhere runs on Android, IOs PC and Mac, on tablets, laptops and smartphones. All you need is an internet connection to access RMSAnywhere from anywhere in the world, to immediately get a complete overview of the availability of your equipment and full control over your jobs, anywhere and always. New: the Crew- and Transportplanning. With this module its possible for the planner to plan technicians (both own crew and freelancers) and vehicles. Crew- and transport costs will be calculated in the quotation stage, and at a later stage technicians and vehicles can be planned. You can immediately see where you need more people and RMSAnywhere gives an overview of costs and revenues of the crew and transport. Unique: the CrewCommunicator. The Crewcommunicator is an unique part of the Crew and Transport module. With the CrewCommunicator, the planner can give access to the calendar which can be shared with specific technicians. The planner can see online which technicians are available, and both technicians and planners can manage the calendar. As soon as the planner plans a technician he or she receives an email with details of the production. The technician can instantly see the details and accept or decline the job. Also the technician can indicate his/her availability on the shared calendar. E-order: The E-order module which can be integrated with you own website, allows designated clients and technicians to create their own equipementlists. After approval, these lists can easily be converted into jobs. By integrating the E-order module with your own website, it can be used as a webshop. You are more than welcome to visit the RMS stand in Hall 9 F92.